Oh, that dreaded red-eye flight. We’ve all been there. If you’re in the air often, you’ve most definitely experienced a late-night flight or two. These flights – often referred to as red-eye flights – typically leave late at night or early in the morning and land in the destination city in the morning. 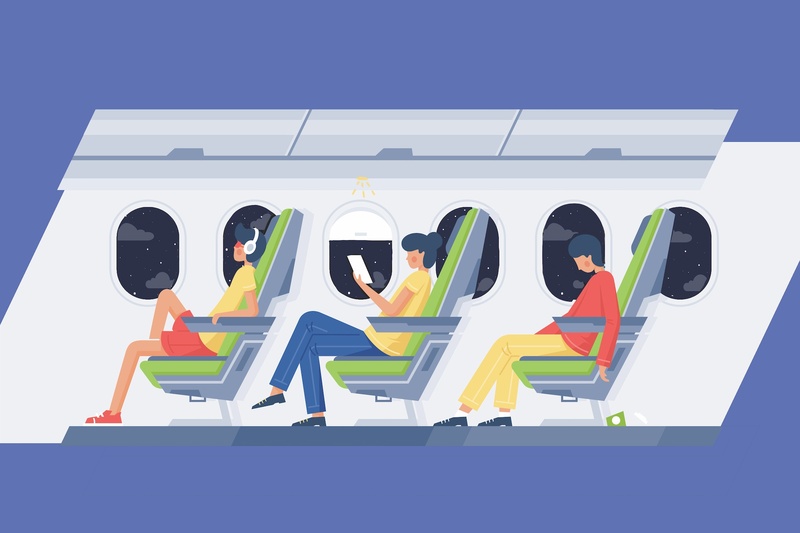 Although red-eye flights have their benefits, from more seating availability to lower prices and less day time spent in the air, these flights can take a toll on our bodies. So why do we dread red-eye flights? And how do we make them (a little) better? The biggest reason we dread red-eye flights is the way they interrupt our routines. The hustle and bustle before a flight, the nighttime driving, stressful delays, and parking issues — all of this completely disrupts our regular schedule. Dreading your flight isn’t just mental. It’s physical. The cortisol production can shoot up with all the stress going on, and the disruption of our circadian rhythm can take up to 2 weeks to recover from. So what’s one way to make a red-eye flight easier? Sleep. While there’s no way to get around your flight’s actual hours, booking a hotel close to the airport to sleep at the night before can help significantly reduce your sleep disruption, giving you a place to go through your regular nightly routines for a few hours of sleep before a flight. You’ll be surprised at how a few extra hours of sleep can change the way you feel the rest of your trip. Travelling stress, especially when it comes to parking, can also be lessened when you book a package that includes parking and airport shuttle service. You won’t have to fight through the grogginess to find parking. You can simply get into your shuttle and step out at your terminal entrance. Our ParkSleepFly.com website can come in handy here for finding the best airport hotel deals that include parking and shuttle service to the airport, and it sorts through the options based on your preferences and budget. What if you don’t have the luxury to park and sleep at an airport hotel? The key is to reduce as much stress and wasted time as possible, so look into finding a reservable parking lot close to the airport, so you don’t have to battle out airport traffic. Using our parking aggregator AirportParkingReservations.com travellers can help ease the stress of flying late at night by ensuring your parking spot is available, accessible and affordable. Off-airport parking lots have shuttles that will take you straight to your terminal so your transition onto the plane can be just a bit smoother. Once you’re on the plane, you’ll want to pick up where you left off with your dreams. If you’ve booked a window seat, you can use the window as a headrest. Packing the right essentials can bring a little extra comfort to your journey. A comfortable eye mask and snug earplugs won’t give you a spa experience, but they’ll drown out the crying infants and reading lights. Need a little more help to fall asleep? Moisturize and use a relaxing essential oil to help ground you and set your mind to snooze. Get enough rest in a manner as close to your usual routine as possible, and you’ll find yourself recovering quicker from your flight in the morning. Flying on red-eye is rarely a pleasant experience, but with these tips, you can make it less miserable. Who knows, you may even step off the plane refreshed! Based out of Los Angeles, Iona Brannon is the Content and Affiliate Marketing Strategist for AirportParkingReservations.com and ParkSleepFly.com. Her hobbies include looking at airplane tickets, sitting in LA traffic, and occasionally yelling at other drivers.